Summer is just around the corner. The weather is heating up, the days are getting longer and it’s the perfect time for ice-cream! It’s also the perfect time to use my new ice-cream maker! I have been thinking about buying an ice-cream maker for a few years. For a long time I thought I didn’t really need another appliance in the kitchen. 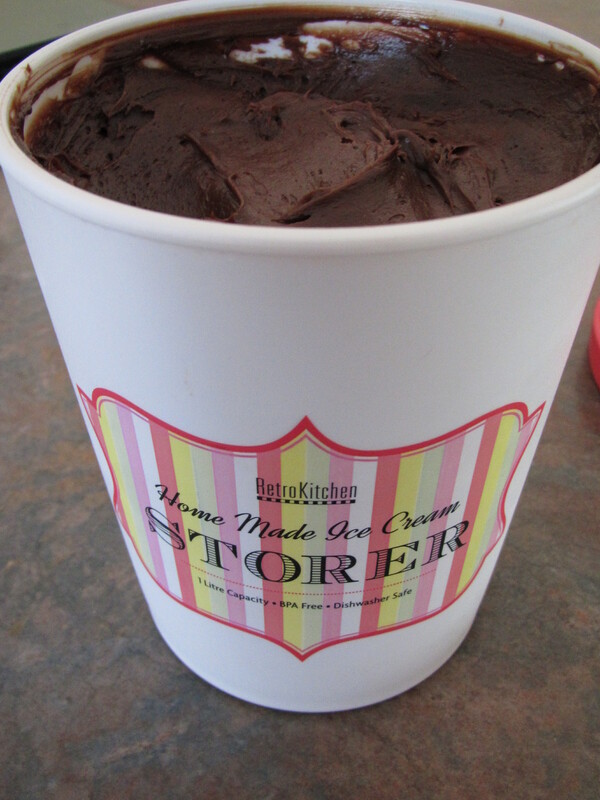 However recently, I decided to give in and research ice-cream maker. After reading reviews I decided to buy the Kitchen Aid attachment. It was a great decision as the attachment lives in my freezer for use at a moment’s notice and doesn’t take away valuable bench or cupboard space. I’ve owned the ice-cream maker a month now and have used it half a dozen times. It’s surprisingly easy and I have to say, while I’ve been conservative with my choices so far (vanilla ice-cream, raspberry sorbet you get the idea!) I’m looking forward to being more adventurous in the future. This ice-cream comes at the request of my sister, a Nutella fiend. Deliciously decadent, and wonderfully smooth. I’m a little addicted! This recipe is from Nigella Lawson’s Forever Summer. It’s titled Baci Ice-cream; as I’ve omitted the hazelnut syrup it’s essentially Nutella ice-cream! If you don’t have an ice-cream maker, never fear! You can still make this recipe. In lieu of using an ice-cream maker – freeze the mixture, stirring every hour for three hours. 1. Whisk the yolks and sugar in a bowl until thick and creamy. While the mixture is beating, bring the cream to the boil. 3.. Reduce the mixture to a slow speed and slowly add the cream to the egg/sugar mixture. 4. Whisk in the melted chocolate into the mixture followed by the cocoa. 5. Pour the chocolate-custard mixture into a pan and cook on a low to moderate heat, stirring constantly with a wooden spoon, until everything’s’ smooth and amalgamated and beginning to thicken. 7. Whisk in the Nutella and transfer to you ice-cream maker following the manufacturers instructions. 8. Transfer to a 1L freezer proof container. Take out about 10 minutes before serving soften a little. It is late in the evening but i would love to try it… Love it!